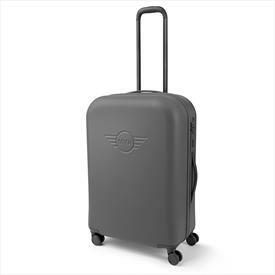 Robust, roomy and beautiful, the MINI Trolley with its debossed frontal MINI Wing Logo is the ideal travel case for long trips away. The main compartment has a 2-way, water-resistant zip closure with an integrated TSA combination lock. Inside, there are compression straps with magnetic Fidlock buckles, an additional mesh compartment and a detachable zip bag to keep contents secure and orderly. On the sides are sturdy bumpers for extra durability. The stable pullout handle and silent multi-wheels make moving with the trolley smooth and effortless.